TEXAS STATE PRISONS ARE NOT AIR-CONDITIONED! Prisoners and Guards suffer in cells and halls above 110 degrees. $20. buys a small fan that can save a life. TX-CURE, Citizens United for Rehabilitation of Errants provides free fans to poor and needy inmates who have no family or friends for financial support. To provide relief, Clark said, Texas prisons offer inmates ice and water and allow them to take additional showers and wear shorts,among other measures. Officers also are trained to recognize signs of heat-related illness. 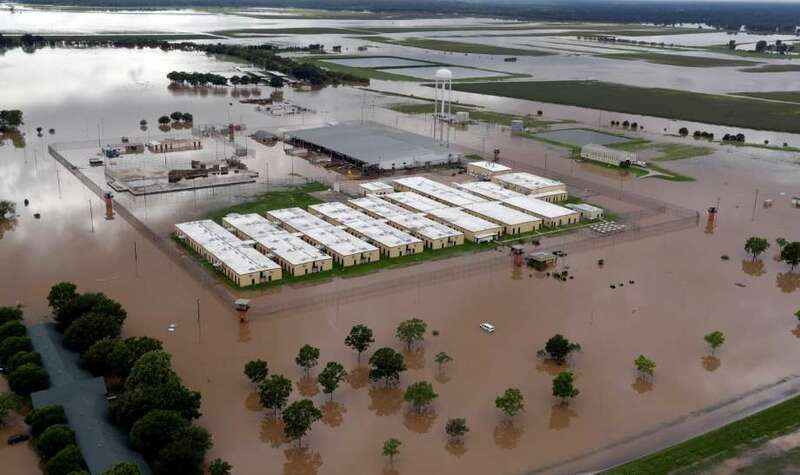 AP published this photo of TDCJ's still-flooded Terrell Unit inundated by the Brazos River in Brazoria County. Might the Lege consider closure instead of paying for repairs? Good News from the Texas Civil Rights Project--the Inter-American Commission on Human Rights will hold a hearing on Oct. 27, 2014 - to examine the extreme heat in Texas' prisons. WASHINGTON, D.C. – The Inter-American Commission on Human Rights (IACHR) has announced it will hold a hearing in Washington, D.C. on October 27, 2014 regarding Texas’ violation of prison inmates’ human rights by exposing them to dangerously hot temperatures. The IACHR is an independent organ of the Organization of American States, whose mission is to promote and protect human rights in the Western hemisphere. Ariel Dulitzky, director of the University of Texas School of Law’s Human Rights Clinic, sought the hearing to present the findings from the clinic’s year-long investigation, which it released in its report “Deadly Heat in Texas Prisons,” on April 22, 2014. The report found the Texas Department of Criminal Justice (TDCJ) is violating the U.S. Constitution and international human rights standards. Earlier this summer, the Texas Civil Rights Project, Edwards Law, and the UT School of Law Civil Rights Clinic filed a lawsuit in Houston federal court to challenge TDCJ’s practice of exposing sick, elderly, and disabled prisoners to dangerously hot temperatures. The Texas Commission on Jail Standards already requires every county jail in Texas to maintain internal temperatures stay between 65 and 85 degrees – from Archer County, with space for 8 inmates, to Harris County, with space for over 10,000 inmates. Other states with hot climates, such as Arkansas, Arizona, Oklahoma, and New Mexico, air condition their prisons. A federal court recently ordered Louisiana to install air conditioning in at the Louisiana State Penitentiary. Even the detention center in Guantanamo Bay, Cuba, is air-conditioned. “It is very fortunate the international human rights community is taking heed of this timely and important issue,” said Dulitzky. The Texas Department of Criminal Justice and its executive director, Brad Livingston, represented by Texas Attorney General Greg Abbott, moved on July 14 to transfer seven cases for pretrial purposes to U.S. District Judge Keith Ellison in the Southern District of Texas, where a class action is pending on behalf of inmates of the Wallace Pack Unit, a geriatric prison facility near Houston. Jeffrey Edwards of Edwards Law in Austin, who represents the plaintiffs in most of the cases, supported the move. The cases—all filed in federal courts in Texas—allege that being housed in temperatures of more than 100 degrees constituted “cruel and unusual punishment” under the Eighth Amendment. They also claim they were not accommodated under the Americans With Disabilities Act and the Rehabilitation Act. Most of the prisoners had disabilities, such as diabetes or hypertension. A call to Abbott’s office was not returned. The cases, including four additional lawsuits that attorneys identified later in court papers, named the department and Livingston, dozens of prison officials and the University of Texas Medical Branch at Galveston, which provides health care to inmates. Most of the cases are wrongful-death actions arising from prisons predominantly in eastern Texas. The class action seeks injunctive relief that would require the facilities to remain below a certain temperature—not unlike a federal judge’s order last year requiring Louisiana state officials to maintain a heat index of no higher than 88 degrees for death row inmates at the Louisiana State Penitentiary at Angola. In the Texas cases, the state defendants have petitioned the U.S. Court of Appeals for the Fifth Circuit to reverse rulings allowing discovery and rejecting motions to dismiss based on qualified immunity for the prison officials. In some cases, plaintiffs have moved for sanctions based on alleged discovery violations. Wall-mounted fans blow a steady breeze in one section of the Wynne unit. AUSTIN – In the latest court challenge to sweltering summer heat inside Texas prisons, four convicts on Wednesday asked a Houston federal court to require state officials to take steps to lower temperatures at a Navasota lockup where they allege it is so hot that metal tables are too hot to touch and metal-walled cell blocks are like ovens. The four felons locked up at the Pack Unit – all with medical conditions and disabilities that are aggravated by high heat – allege in their suit that they are being subjected to inhumane conditions that violate the U.S. Constitution. The lawsuit also alleges that prison conditions have been blamed in 20 heat-related deaths since 1998. The suit, the first one seeking class-action status that could open the prison system up to statewide litigation, joins more than a half-dozen other lawsuits already pending over summer heat inside Texas' 109 state prisons that are largely un-airconditioned. Prisons in the Houston and Huntsville areas, and in areas south and west of San Antonio have been targeted by complaints. "Pack is a geriatric unit that has hundreds of inmates over the age of 60, and hundreds more suffer from heat-sensitive medical conditions," said Austin attorney Jeff Edwards, lead counsel in the new case. "(Prison officials) know the temperatures at Pack put these prisoners in danger rather than cool the housing areas or move the prisoners to safe locations. They play Russian Roulette with their health." The lawsuit seeks a court order requiring prison officials to lower the temperatures in prisoner areas at Pack to a maximum 88 degrees, a level set last year by a Louisiana federal court as safe in prisons there. Prison system spokesman Jason Clark said prison officials do not comment on pending litigation. In the past, officials have said they provide water and fans to keep summer temperatures down, in a prison system that has never provided air-conditioning except in medical units and special-needs areas. A New Report (pdf) titled "Deadly Heat in Texas Prison" from the Human Rights Clinic at the University of Texas School of Law argues that, "The Texas Department of Criminal Justice (TDCJ) is currently violating the human and constitutional rights of inmates in Texas by exposing them to dangerously high temperatures and extreme heat conditions." 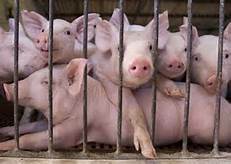 In August, right around the time when the Texas summer heat was at its brutal worst, the state's prison system finalized a bid to replace its aging swine-production facilities with 6 new climate-controlled modular barns, at a cost of $750,000. The pigs raised for inmate consumption were going to get relief from the heat, but the state's inmates would continue to suffer. In the last 6 years, at least 14 inmates died from heat stroke or hyperthermia in overheated Texas prisons, where air-conditioning is scarce and temperatures can reach 130 degrees. The correctional officers, whose working conditions are the same as the inmates' living conditions, have taken note. Several inmates' families have filed wrongful-death lawsuits, and the officers' union supports them. We also support those officers who plan to take legal action against the state because of intolerable heat in their workplace. Texas has the largest state-run prison system in the country, with over 152,000 inmates currently incarcerated. In 1978, the courts forced Texas to expand its system, which has since grown from 18 prisons to the current 109. To feed its vast inmate population and keep costs down, the prison system raises its own livestock and crops across 141,000 acres. The prison system also tries to save money on climate control. The Texas Commission on Jail Standards requires all county jails to keep the temperature below 85 degrees - not necessarily a comfortable temperature, but a humane one. Still, the county jails house only 70,000 inmates, fewer than half as many as the state prisons, which are exempt. Some prisons have had air-conditioning installed, but only in the hospital areas and the administrative offices. The overheating in prisons is made even more dangerous by other cost-cutting measures. Employment screening for correctional officers is inadequate, and a physician's examination isn't required for applicants - even though they'll be expected to work in a physically demanding job up to 12 hours a day, sometimes in heavy Kevlar vests, often in extreme heat. And just as the inmate population is aging, the officer population is getting older, too: with the economic downturn, we've seen retired officers returning to the job. I once worked with an officer who was 82 years old. Like the older inmates, many of these older officers take medications that make them particularly sensitive to the heat, including antidepressants and diuretics to control high blood pressure. Under the Americans With Disabilities Act, the prison system may be liable for not providing reasonable accommodations. More than 15 % of the inmate population has been found to have a mental illness, and some of them refuse to take their psychotropic medications in the summer, because the drugs can make them heat intolerant, leading to assaults on other inmates and correctional officers. Union officials have complained about dangerous overheating in Texas prisons for over 15 years, to no avail. I've seen some of my co-workers pass out from the heat. Last year, 92 state correctional officers reported heat-related illnesses as a result of working in prisons lacking climate control. Texas needs to ensure humane conditions for the inmates who live in prisons and the officers who work there. After all, people shouldn't be treated worse than the livestock. The Texas Civil Rights Project filed lawsuits earlier this summer accusing the agency of inadequately treating four prisoners who died from heat stroke. Though the prison agency provides air-conditioned areas in each prison, cooling is usually limited to solitary confinement, death row and medical facilities, Medlock said. “Even though ten men died of heat stroke in 2011 – and eight of them died in his ‘region’ – Eason did not consider these deaths a serious problem. In fact, in the face of these deaths, he believed TDCJ was doing a ‘wonderful job’ and ‘[didn't] have a problem with heat-related deaths,’” the complaint states. “Eason’s direct supervisors, [Brad] Livingston, [TDCJ Correctional Institutions Division Director Rick] Thaler and [Thaler's Deputy Director William] Stephens, were similarly unconcerned. The deaths of prisoners from heat stroke at the Gurney Unit and system wide were regularly discussed at meetings Thaler and Stephens held with their deputies, including Eason. Lawsuits: At least 13 men overheated, died in un-air-conditioned Texas prisons Prison officials say summer precautions taken to protect convicts, staff; attorneys allege conditions inhumane, and illegal. Texas prides itself for being tough on crime. Many think that imprisoned inmates should be punished, rather than rehabilitated. But there's such a thing as "cruel and unusual" punishment, which framers of the Constitution prohibited in the Eighth Amendment. Does being locked in a prison cell, during a Texas summer, that is not only unair-conditioned but unventilated, and in which heat indexes can reach 130-plus degrees, constitute cruel and unusual punishment? The Texas Civil Rights Project thinks so, and is suing the Texas Department of Criminal Justiceon behalf of several inmates, including some who died in last year's heat wave. Ten prisoners died during a 26-day stretch last summer, and, according to Scott Medlock, director of the TCRP's Prisoners' Rights Program, an unconfirmed number have died this year. Medlock's suit on behalf of former inmate Eugene Blackmon was thrown out in lower court but recently reinstated by the Fifth Circuit Court. In it Blackmon alleges that the heat inside his Garza East prison dormitory in Beeville caused him to suffer from headaches, nausea and blurred vision. Prison officials have refuted Blackmon's claims, saying that they took adequate precautions, including access to ice water and extra showers. Medlock is also suing the state for wrongful death in the case of Larry Gene McCollum. Like other inmates who died, McCollum was a likely candidate for heat related tragedy, as he was morbidly obese and subject to high blood pressure. Medlock says that his group is not necessarily calling for the state to air-condition all of its prisons, but that state prisons should at least offer some air-conditioned relief areas during heat waves, and that the most vulnerable prisoners, like McCollum, could be transferred to air-conditioned units (21 out of 111 state prisons are air conditioned) or to older units that have better ventilation. "The state is inviting the federal courts to intervene in our prison system," Medlock warns. "To avoid a protracted bout of federal court supervision, they'd better get on the ball. Do the right thing and the smart thing." We agree. If it's illegal in Texas to expose a pet to deadly conditions, then we shouldn't be able to do so to prisoners either, no matter how tough on crime we are. 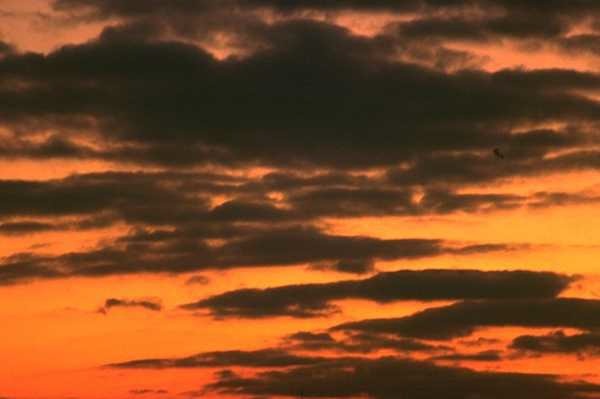 For much of the summer of 2008, temperatures in Beeville, Tex., soared above 90 degrees. For almost two weeks, the heat index was 130 degrees or higher, in what scientists consider the “extreme danger” range, when the risk of heat stroke is imminent. The heat was stultifying inside the C-8 dormitory of the Texas state prison in Beeville, which housed 54 men. The unit did not have any air-conditioning and the windows were sealed tight. Eugene Blackmon, an inmate, then about 63 years old with high blood pressure, said that the warden and others also turned on the unit’s heaters — and then failed to respond to numerous grievances he filed about the heat and its terrible effects on his health. That includes protecting inmates from heat exhaustion, which can lead to headaches, nausea and other symptoms that Mr. Blackmon suffered. The prison said it provided relief to inmates as the appeals court required in a 2004 case: iced water, extra showers and fans. But often the prisoners did not have enough iced water, shower time or working fans. A federal trial court rejected Mr. Blackmon’s lawsuit, saying there was no proof the heat in the prison caused health risks to anyone. The appeals court, however, found that there was a lot of proof that Mr. Blackmon’s health was severely affected. He certainly deserves the chance to convince a jury. Prison Heat can be "Cruel and Unusual Punishment"
Many readers of this newspaper have made it very clear over the years that they really don't care what happens to people in prison. Their latest outcry came a couple of months ago when I made an appeal to donate fans for indigent prisoners who are suffering in penitentiaries that can become furnaces during Texas summers. "They're behind bars to be punished," is the usual retort. "They ought to suffer." And, of course, there's always the admonishment: "You should spend more time thinking about the victims than a bunch of criminals." I do think about victims, and I've spent a lot of time covering their stories. But I will not stop seeking fair treatment of those who are incarcerated. After all, society demands justice, not persecution; humane treatment, not barbarism. Two crucial findings last month -- one by a court and one by a newspaper -- have put the focus back on the Texas prison system and the unbearable heat conditions in the vast majority of its 111 penitentiaries. The 5th U.S. Circuit Court of Appeals in New Orleans, ruling in the case of a 64-year-old former inmate, said that exposing inmates to extreme temperatures "can constitute a violation of the Eighth Amendment." The Eighth Amendment prohibits the use of cruel and unusual punishment. Eugene Blackmon, a minimum-security inmate with high blood pressure, served three years in the Garza East Unit in Beeville, The Texas Tribune reported. The Texas Civil Rights Project sued the Texas Department of Criminal Justice on his behalf in 2008. "For more than 50 consecutive days that summer, according to court documents, temperatures inside the unit reached levels that the National Oceanic and Atmospheric Association considers cautionary or dangerous," the Tribune said. "Temperatures inside the prison, Blackmon's lawyers said, reached a heat index of 130 degrees." The New York Times reported that 10 inmates housed in Texas prisons died from heat-related causes last summer in a 26-day period in July and August. "All of them were found to have died of hyperthermia, a condition that occurs when body temperature rises above 105 degrees, according to autopsy reports and the state's prison agency," the Times noted. The news article said a total of 12 prisoners had died of heat-related causes since 2007, including one man whose body temperature was 108 degrees. The inmates did have other factors contributing to their deaths, including several with hypertension and heart disease. It was after hearing stories of heat-related deaths that Burleson residents Kenneth and Lois Robison with Texas Citizens for Rehabilitation of Errants (TX-CURE) started the indigent fan project. It's a program I have supported for many years. The Robisons' son, Larry Robison, was executed in 2000 for the 1982 murder of Bruce Gardner, one of five people killed in a brutal attack near Lake Worth. The organization made its final fan purchase for the summer at the beginning of the month, said project coordinator Dorothy Deen. With the help of many Star-Telegram readers -- those who do care about the humane treatment of prisoners -- 570 fans were provided to indigent prisoners this year, Deen said. She noted that 150 inmates who qualified to receive a fan remain on the waiting list. "I received a thank-you letter from a prisoner who described to me how he had stood each day in a circle with other inmates, and all of them were praying that this man would get a fan from TX-CURE," Deen said. "His fan had just arrived, and he said that God had answered their prayers." The fan project has been a godsend for almost 7,000 prisoners over the last 12 years. If one death is prevented because an inmate received a $20 fan, our efforts have been worth it. Oh, I know, there are still those of you sitting in your air-conditioned homes and offices who are saying, "Who cares? Let them suffer." In a case involving a 64-year-old former Texas Department of Criminal Justice inmate who suffered from hypertension and other medical ailments, the federal court in New Orleans held that allowing an inmate to be "exposed to extreme temperatures can constitute a violation of the Eighth Amendment." HOUSTON — Last summer’s record-breaking heat wave had a grim impact on Texas, playing a role in the deaths of roughly 150 people. Many of them were found in their homes or apartments, but a few were discovered somewhere else — in their prison cells. One inmate, Alexander Togonidze, 44, was found unresponsive in his cell at an East Texas prison called the Michael Unit at 8 a.m. on Aug. 8 with a body temperature of 106 degrees, according to prison documents. The temperature in his cell, taken by prison officials 15 minutes after he was pronounced dead, was 86.2 degrees and the heat index was 93 degrees. Five days later, at the nearby Gurney Unit prison, Kenneth Wayne James, 52, was found in his cell with a body temperature of 108 degrees. His autopsy report stated Mr. James most likely died of “environmental hyperthermia-related classic heat stroke,” noting several risk factors, including Mr. James’s chronic illness and use of a diuretic, and the lack of air-conditioning. Officials with the prison agency, the Texas Department of Criminal Justice, said 12 inmates had died of heat-related causes since 2007. The debate over the lack of air-conditioning in the prison system has intensified in recent weeks, after lawyers from the nonprofit Texas Civil Rights Project sued the agency in federal court over one of the inmate deaths from last summer. They also plan to file additional wrongful-death lawsuits. Of the 111 prisons overseen by the agency, only 21 are fully air-conditioned, and inmates and their advocates have argued that the overheated conditions during triple-digit summers violate the Eighth Amendment’s prohibition against cruel and unusual punishment. Prison officials dispute those claims, saying that the health and well-being of the inmates are their top priorities and that the autopsies of the 12 inmates who died list a variety of contributing factors to their deaths. They said they take steps to help inmates on hot days, including restricting outside work activities and providing extra water and ice. But a corrections supervisor who works at a prison where one of the 12 inmates died said the number of heat-related fatalities was a cause of concern, as was the larger number of inmates and corrections officers who require medical attention because of the heat. One of the 10 inmates who died last summer, Larry Gene McCollum, 58, a prisoner at the Hutchins State Jail outside Dallas, had a body temperature of 109.4 degrees. Nine days before his death in his cell, the indoor temperatures at Hutchins were routinely recorded by prison officials and ranged from 100 degrees to 102 degrees, according to agency documents. Those temperatures exceed those allowed by a state law requiring county jails to maintain temperature levels between 65 and 85 degrees in occupied areas. But the law applies only to county jails, not to state prisons. State Senator John Whitmire, a Houston Democrat and chairman of the Senate Criminal Justice Committee, said he was not alarmed by the number of deaths, noting that the overall state inmate population exceeds 150,000. Keith Price, the former warden of the Coffield Unit, agreed. Prison officials said that air-conditioning had not been installed in many buildings because of the additional construction and utility costs, and that retrofitting them would be an extraordinary expense. Prisoners’ rights advocates said that treating inmates who become ill from the heat is just as costly, and that retrofitting entire buildings was not the only possible solution. They said allowing medically high-risk inmates to spend time in air-conditioned areas would be one improvement. A version of this article appeared in print on July 29, 2012, on page A17 of the National edition with the headline: In Texas, Arguing That Heat Can Be a Death Sentence for Prisoners. the summer of 2008. "It felt like an oven," he said. AUSTIN, Tex. — In the brutal heat of summer, many Texans flee to shopping malls, movie theaters and other air-conditioned havens to keep cool. But for one segment of the population, there is literally no escape from triple-digit temperatures: state prison inmates. Only 21 of the 111 prisons overseen by the Texas Department of Criminal Justice, the state prison agency, are fully air-conditioned. Many of the prisons that do have air-conditioning in areas where medical services or educational programs are provided to inmates do not offer it in the sections where they live. Inmates and their families have complained for years about the heat and lack of air-conditioning in the summertime, but the issue has taken on a new urgency. An appeal is pending in a lawsuit initially filed in 2008 by a former inmate claiming that 54 prisoners were exposed to Death Valley-like conditions at a South Texas prison where the heat index exceeded 126 degrees for 10 days indoors. And several inmates at other prisons died of heat-related causes last summer; a lawsuit was filed Tuesday in one of those deaths. Texas has long had a reputation for running some of the toughest prisons in the country, but inmates and their advocates say the overheated conditions violate the Eighth Amendment’s prohibition against cruel and unusual punishment. They accuse prison officials of failing to supply enough fans, ventilation and water and refusing to follow local and national prison standards. A Texas law requires county jails to maintain temperature levels between 65 and 85 degrees, but the law does not apply to state prisons. The American Correctional Association recommends that temperature and humidity be mechanically raised or lowered to acceptable levels. A prison agency spokesman, Jason Clark, said that many prison units were built before air-conditioning was commonly installed, and that many others built later in the 1980s and 1990s did not include air-conditioning because of the additional construction, maintenance and utility costs. Retrofitting prisons with air-conditioning would be extremely expensive, he said. As a result, the agency takes a number of steps to assist inmates, Mr. Clark said, and he disputed the criticisms of inmates and their lawyers about inadequate fans, water and ventilation. On hot summer days, he said, prison officials restrict outside activity, provide frequent water breaks, allow additional showers, permit inmates to wear shorts and increase airflow by using blowers normally used to move warm air in the winter. “The agency is committed to making sure that all are safe during the extreme heat,” Mr. Clark said in a statement. Despite those measures, four inmates — Larry Gene McCollum, 58; Alexander Togonidze, 44; Michael David Martone, 57; and Kenneth Wayne James, 52 — died last summer from heat stroke or hyperthermia, according to autopsy reports and the authorities. Advocates for inmate rights believe that at least five others died from heat-related causes last summer. The cause of death was hyperthermia, the autopsy report said. Mr. McCollum was “in a hot environment without air-conditioning, and he may have been further predisposed to developing hyperthermia due to morbid obesity” and use of a diuretic for hypertension, the report noted. Mr. Clark, the prison agency spokesman, said it was unknown whether the lack of air-conditioning was a factor in the deaths. The agency does not comment on pending litigation, he said. Eugene Blackmon, 67, the former South Texas inmate who sued, said the conditions inside the C-8 dormitory at the Garza East prison caused him to have headaches, blurred vision and nausea. Mr. Blackmon was an inmate there in the summer of 2008 for a parole violation on a stolen-goods charge. After he filed his lawsuit, his lawyers hired an expert who took measurements inside the dorm in 2010 and retroactively calculated the indoor temperatures for the summer of 2008. The heat index inside reached a high of 134, the expert determined. In court documents, the state attorney general’s office, which is representing the prison officials, denied Mr. Blackmon’s accusations, saying that he made no complaints of a heat-related illness or vision problems at the time and that his blood pressure readings improved rather than worsened over time. An air handler ventilating the dormitory, an industrial fan and a rooftop purge fan — in addition to extra shower privileges and ice water three times a day — increased the level of comfort in the C-8 dorm, the state’s lawyers argued. A version of this article appeared in print on June 27, 2012, on page A15 of the New York edition with the headline: Two Lawsuits Challenge the Lack of Air-Conditioning in Texas Prisons. As summer temperatures rise, annual worries about high temperatures in Texas jails have returned. Only 19 of the 97 Texas Department of Criminal Justice prisons are fully air-conditioned, and 37 are partially air conidtioned. TDCJ officials did comment immediately on the lawsuit. Scott Medlock, director of the TCRP's prisoners’ rights program, said the Hutchins facility was not air-conditioned and the temperature inside the jail last summer was nearly the same as outside, about 96 degrees with a heat index between dangerous and extremely dangerous. Medlock said that McCollum's body temperature was above 109 degrees when he arrived at the hospital. Prison officials distributed limited amounts of water to the inmates, but because McCollum had not yet received an identification card, he could not purchase a cup to drink the water. He could not purchase a fan, either. Earlier this month, the U.S. Fifth Circuit Court of Appeals in New Orleans heard arguments in another lawsuit against TDCJ that the TCRP filed in 2008 alleging that conditions in its facilities are unconstitutional. The Texas Civil Rights Project sued the TDCJ in 2008 on behalf of Eugene Blackmon, a 63-year-old minimum-security inmate with high blood pressure who was serving three years in the Garza East Unit in Beeville. Blackmon is now out of prison, but he said he suffered dizziness, nausea and headaches when the temperature in his cell soared up to 130 degrees Farenheit. The civil rights organization said in oral arguments on June 5 that they weren’t calling for air conditioning in all the prison units, but instead for appropriate accommodations for the high temperatures. Medlock said nine inmates died last year from heat-related causes. In letters from his prison cell at the McConnell Unit in Beeville, Susan Fenner’s son describes miserably hot and dangerous conditions. The temperature is more than 100 degrees outside, and the heat radiates through his tiny un-air conditioned box of a cell in administrative segregation. “There’s not much circulation, and it’s just horrible,” said Fenner, who is executive director of the Texas Inmate Family Association. 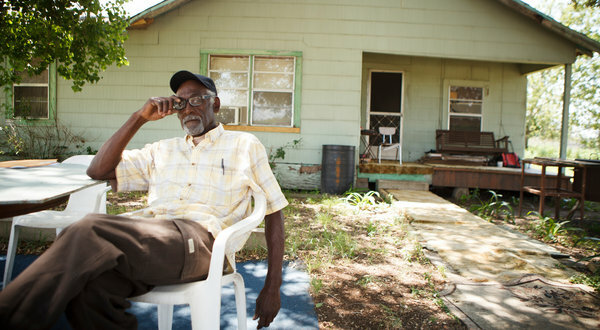 Like many of the 150,000 prisoners across Texas, Fenner’s son lives without air conditioning. As the heat index statewide soars above 100 degrees day after day, inmate advocates say complaints about sweltering conditions are increasing along with concerns about prisoners’ health. A case currently pending before the U.S. Fifth Circuit Court of Appeals, though, could change the way prisons operate under the hot summer sun. Just 19 of the 97 prison facilities run by the Texas Department of Criminal Justice are fully air-conditioned. Another 37 facilities are partially air-conditioned, and nine are ventilated with tempered air that is blown over cooled coils. 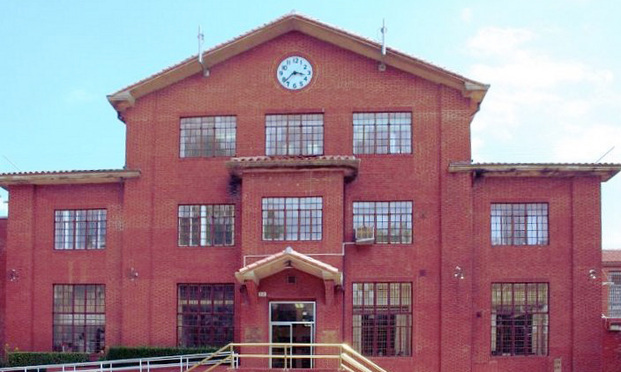 Many of TDCJ’s facilities were built before air conditioning was common. And newer prison buildings are not often constructed with air conditioning in mind, said TDCJ spokeswoman Michelle Lyons, given the unsympathetic population in question — those who have been convicted of breaking the law. “It’s presumed taxpayers are not going to want to fund air conditioning of the units,” she said. Medical facilities, infirmaries and geriatric units are all air-conditioned, said Lyons said. And TDCJ staff are trained to identify and treat heat-related illnesses. Inmates can buy fans from the prison commissary, and there are programs in place to help those who can’t afford to buy fans. There also are large industrial fans in common areas, Lyons said. Of course, it’s not only inmates who suffer through the scorching temperatures. TDCJ staff, she said, work in the same conditions. “We are committed to making sure all are safe,” she said. When temperatures skyrocket, TDCJ officials implement system-wide protocols to prevent overheating. Inmates are allowed more water, additional showers, and in some cases they can wear shorts. But Fenner said not all the prison units apparently take those precautionary measures. Inmates and their family members are sending the association a steady stream of e-mails with complaints about the heat. While her son will probably be OK, because he is relatively young and health, Fenner said inmates with mental health problems and physical ailments could be at risk. “There are rules about how you treat animals, but they don’t apply to prisoners,” she said. The Texas Civil Rights Project has sued the TDCJ to force the agency to better protect inmates from the heat. 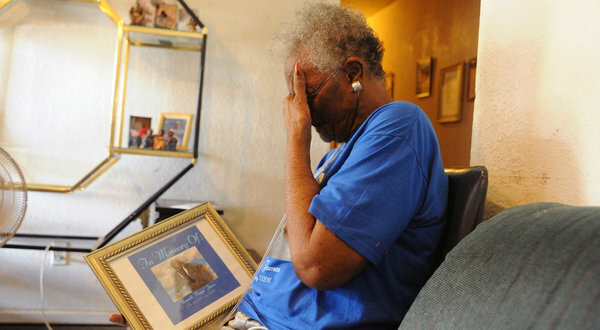 In 2008, the group sued on behalf of Eugene Blackmon, a 63-year-old minimum-security inmate with high blood pressure who was serving three years in the Garza East Unit in Beeville. For more than 50 consecutive days that summer, according to court pleadings, temperatures inside the unit reached levels the National Oceanic and Atmospheric Association considers cautionary or dangerous. Blackmon, who is now out of prison, said he suffered dizziness, nausea and headaches. Even after complaints, wardens allegedly took little or no action to help. The lawsuit claimes the conditions amounted to unconstitutionally cruel and unusual punishment. “The bottom line is they can’t be having people living in an oven,” said Jim Harrington, executive director of the Texas Civil Rights Project. Prison officials argued in court documents that Blackmon did not show he suffered physical injury and that the issue was moot since he was no longer in that prison. A judge dismissed the lawsuit, and it is now on appeal before the federal appeals court in New Orleans. Sean Flammer, a lawyer at Scott Douglass and McConnico, said if the appeal is successful it could affect prison conditions in Texas, Louisiana and Mississippi. If you can’t stand the heat, stay out of prison. Jason Clark, public information officer for the Texas Department of Criminal Justice (TDCJ), said no prison units in Abilene and surrounding area are equipped with air conditioners. Statewide only 19 of 112 state prisons are air-conditioned, with the cooled prisons generally reserved for sick and mentally-ill inmates, Clark said. Texas summer temperatures typically push over 100 degrees, especially in July. Clark said estimating the temperature in the prisons without air conditioning depended on several variables. About 155,000 inmates are in Texas prisons. When temperatures top 90 degrees, prisons allow work crews to start earlier, take longer breaks and drink more water. Inmates are allowed to wear shorts in recreation rooms and the warden will monitor the temperature hourly and broadcast the information to the unit. Officers are required to undergo “extensive training” in identifying and treating heat illnesses. Most also carry pocket cards with tips to prevent extreme heat exposure. Additionally, units have tempered-air fans, “which are big fans that move the air throughout,” Clark said. The electric fans are placed in hallways, day rooms and dormitory units throughout the prison. Offenders can also purchase personal fans for $22. Last year nearly 15,000 fans were sold. 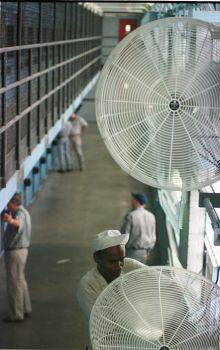 Indigent prisoners have the opportunity to participate in a program that supplies them with a fan. “The safety of our staff and offenders is paramount,” Clark said. This year seven prison employees and nine inmates have suffered heat- related illnesses, with the closest occurring at the TDCJ’s Hobby Unit, located 200 miles southeast of Abilene in Gatesville. A correctional officer became overheated and was transported to hospital. Some Louisiana and Florida prisons also do not have air conditioning. Heat cases only come to court when prison officials knowingly put prisoners in dangerous conditions, according to the American Civil Liberties Union of Texas. For the vast majority of the state’s 155,000 prisoners — not to mention the men and women assigned to guard them — Texas’ brutal summers are faced head-on, with only fans and primitive air- circulating systems for comfort. Such measures are critical at prisons such as Ellis, where many of the unit’s 2,366 inmates work in the fields or prison shops. Temperatures are monitored hourly, said Warden Eileen Kennedy, and both prisoners and guards are schooled in the signs of heat-induced illness. “It’s a lot of common sense,” Kennedy said of Ellis’ heat- abatement policies. Field workers, she said, begin their shifts early in the morning, generally finishing their tasks by noon. Imagine living in a small concrete and steel cell without air-conditioning, cross ventilation or even a small fan to relieve the heat. Every year, we get reports of TX Prisoners who become very ill or even die from the extreme heat. Where the summer temperatures consistantly reach 115 degrees in some areas of Texas. TDCJ only provides air-conditioning in staff areas, some psychiatric units and hospitals. The Texas Heat, Man Is It A Coming! While today boasting a balmy Low to Mid 90's across areas like Huntsville, Houston, Dayton, with a feels like on the brink of Triple digits. And Gatesville nailing the 99 degree marker with feels like 101, it sure must be gettin mighty warm in them prisons. It's been a strongly heated (pun intended) discussion on some boars for the last few days. Inside temperatures reach upward of 105 to 110 degrees in the middle of the day in indoor areas at some facilities. All the while the dead of silence surrounds the HVAC systems at TDCJ facilities. Well we all know the old mighty dollar isn't fairing so well, and W's old friends in TX aren't helping do much about the cost of energy either. What the TDCJ fails to understand, or maybe refuses too, it that the upfront savings cooking the inmates might be, the back end is gonna cost them a pretty penny. While I have heard the arguments, and trust me I have heard some fairly ridiculous excuses, most of them revolve around the same thing, just slightly candy coated. It is that time of year when employees and offenders will be affected by extreme heat conditions. As a reminder, due to the potential for extreme heat conditions in upcoming months, it is imperative that everyone take precautions to help reduce heat-related illnesses. Administrative Directive 10.64, "Temperature Extremes in the TDCJ Work Place", and Health Services policy B-15.2, "Heat Stress" should be reviewed by staff for general awareness. Unit training should be completed by June 1, 2009. It is very important to ensure all training has been documented in the employee's file. Pocket cards with tips for recognition, treatment, and prevention of heat-related illnesses are available for units to order from the Prison Store. Wardens need to ensure all correctional employees are provided with or currently have pocket cards. In May, staff from various departments (Offender Transportation, Health Services, Risk Management, Laundry and Food Service, Environmental, and Plans and Operations) will meet to review and discuss issues regarding precautions and actions taken last summer and to discuss actions for the upcoming summer. Following, you will find a list of precautions/actions to be implemented starting June 1, 2009 and ending October 1, 2009. If the need arises, implementation may begin prior to June 1, 2009. Ensure employees and offenders are aware of the signs and treatment for heat-related illnesses by conducting training. Ice should be provided if available to employees and offenders in work and housing areas. Restrict outside activity (work hours) in accordance with AD 10.64. Ensure all staff and offenders working in areas of extreme heat (i.e., field, maintenance, yard squad) are provided frequent water breaks. Refrain from transporting psychiatric in-patient offenders to another facility via chain bus. Transport offenders during coolest hours of the day. Screen outgoing chains to ensure that the selected mode of transportation is appropriate. Allow offenders to take fans when being transported off the unit for medical appointments. Utilize INFOPAK report (IMS042) listing offenders with heat-sensitive medical restrictions. Load and Unload transfer vehicles as quickly as possible. Transfer vehicles parked for more then 15 minutes are required to place a fan, previously purchased, on the vehicle. Units should ensure that fans, extension cords, etc. are in place and available when needed. Store paper towels on transportation vehicles to be wet down to utilize in emergencies. Water coolers on buses should be refilled at various times during the day to maintain water at appropriate temperature. When utilizing fans, air should be drawn through the structure and exhausted outside. Take full advantage of the fresh air exchange system and/or prevailing winds to assist in the movement of air as applicable. Increase airflow by utilizing blowers, when and if appropriate, normally used to move hot air in the winter. Attach ribbons to vents to ensure blowers are being used appropriately. Ensure all maintenance to blowers has been completed. Allow additional showers for offenders. Allow offenders to wear shorts in dayroom and recreation areas. Make water available during meal times. Make sure window screens are clean so as not to restrict airflow. Fans will be allowed in all custody levels (to include administrative segregation and disciplinary status). Offenders with fans stored based on these restrictions shall have their fans re-issued for the time period specified in this posting. All offenders shall be permitted to purchase a fan if they do not have one. Ensure that the fan re-cycling program is in place, allowing the permanent issue of a fan to an offender who has been indigent for the previous six months on a first-come, first-serve basis. Offenders who have significant medical needs, based on a condition or medication that is negatively impacted by the heat, shall be given priority. Well thank you TDCJ for the precautionary measures! While some of these may help, the rest are really a band-aid on the problem not a solution. Plain and simply, one death caused by over expossure to heat could potentially cost the TDCJ, The State of Texas and it's Taxpayers much more than the cost of running currently in place HVAC systems at a minimal level. No one os saying they need to cool the place down to 70 degrees, mid 80's would more than solve and prevent any issues or complaints. Here is a thought, you know that area where the Staff has been having to wear their Jackets cause they keep it too cold.. OPEN the DAMN DOOR! Not only does the TDCJ fail to recognize the immediate health issues the rising temperatures will undoubtedly cause, they never address the fact that it is also a safety concern. 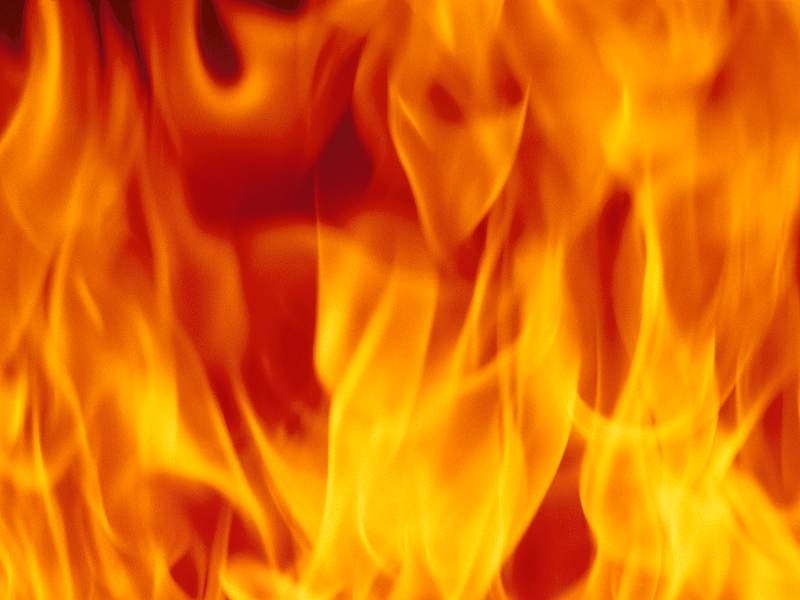 Prolonged exposure to the heat will cause stress and aggravation among the inmate population, aggravation that in turn can easily turn into violence, against other inmates or TDCJ staff itself. Maybe the fact that we spend all the money trying to put as many people in prison as we possibly can (over 172,000 in 2005 in Texas) leads to too many shortfalls in other areas, not to mention the normal wasted spending in all areas of Government. Let's spend some of the taxers payers on lowering the population through rehabilitation, education and reform, improving the Parole and Probation systems, and reducing the number of non violent first time offenders getting exorbitant sentences. Investing in renewable energy resources to provide power to the Facilities, overall everyone comes out ahead. Recently in the news one of Texas' many Oil tycoons announced he was investing some $200 Million on building windmill Farms in Texas. Hmm, let's see here, a lot of land surrounds Prisons, land that will only be used to build more, and bigger prisons, which will exacerbate the already growing Budget of the TDCJ. Let's think for a second, Public/Private partnerships, the State allows the Windmills on TDCJ owned in land, in exchange for power from those windmills to provide electricity for the nearby prisons. Win/win? You be the judge, do you want to continue to pour your hard earned dollars into an already obviously failed system, or get more for you buck, help the environment, treat humans like human beings, lower energy costs across the board and provide work in areas that need it? Wise up Texas... it's not only about "prisoners" the impact is far reaching.